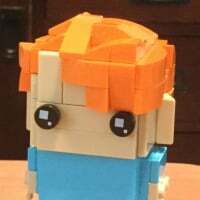 Called Lego customer service earlier today as my recent online order got cancelled. The lady told me the promotion has extended to Oct 31, 2015. Does anyone hear about this? 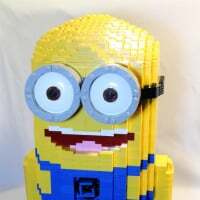 Saw this on another site as well. Apparently some one had a major change of heart from only 4 days to the whole month? [email protected] now says it runs through Oct 31. I'm guessing sales need goosing a little. 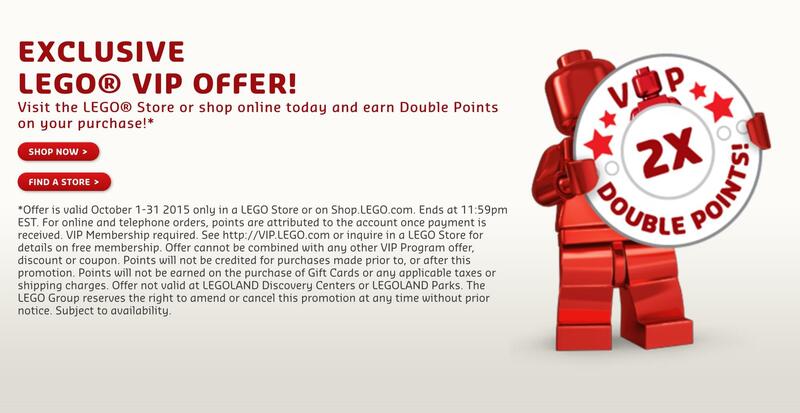 I got a email from lego and double VIP points have been extended till Oct 31. Sales must have been lagging a little behind last year for them to have hanged the promotion twice. I got a VIP card for my 16 year old son. Since he has to be 18 years or older, can I make an account and use the same VIP card? Hot dog! Double bonus plus the Christmas train! That's like getting 30% off on your $100.00 order. I suspect LEGO has a target for how many double points they want to award during the promotion and that they are trying to gauge how long it takes to reach that target. By extending the double points this way they are going after the customers who were on the fence about buying this month, as I'm sure those who weren't (like me) have already committed to a purchase. Maybe if their website wasn't a POS every time there was a promotion they would get more sales. Lately, every time I am on [email protected], first click get me where I asked, like creator them, order status, but then the 2nd click, to see a specific order or set, I am back to the home page.. can't do anything. Same with Chrome or IE. "We are currently experiencing technical difficulties and your order may take up to 24 hours to process. Please note that if your order qualifies for promotions, they will be applied after we have processed your transaction. Express shipping options and payment using VIP rewards are not available during this time. Product availability may also be inaccurate during this time. Your order confirmation email will be delivered after your transaction has been processed." @Dawn Ive had this same experience several times over the last month or so. The horror stories with the site just make me wish I had a LBR store closer to home. Wait, no, I would be broke then. I just placed an order last night (in the US) by phone because of the online issues. However, the order online does not indicate that the free train set was added. I presume LEGO is good about honoring their promotions, but I'm weary that this will require further phone calls and polite complaining. Has anybody had a similar experience in the past? I placed an order online once where the frontpage said that free gift was included but the final receipt did not. I *assumed* it was a glitch but the order arrived without the gift. I called and they said that it was while supplies last, so the answer is likely no. Well supplies are still lasting; the train is not sold out. Last day of the double points. Did anyone pick up the Scooby Doo poster at a Lego store that's being given out today?